What Do Wiper Blades Have to do With Your Driving Safety? Windshield wiper blades live outside of your vehicle, exposed to heat and sun which causes them to get dry, brittle and torn. Think of wipers as part of an important safety system that keeps our windshields clear so we can see where we are driving. Our vision is important to us and we protect our eyes. If we need contacts or glasses, we take care of them too. Think of wipers blades as also critical to our vision when we drive. We should think about maintaining safety not just responding when our wiper blades stop doing their job. Have you ever been caught off-guard by a storm and had to drive with a streaky windshield you could barely see through? Or with no washer fluid? You may not realize it at the time but failed wipers can be very dangerous. Imagine you are driving at night and it starts raining. You turn on your wiper blades and they are worn so the blades just smear all of the crud on your windshield and it becomes a big blur. Scary, right? Well, you can avoid this. We recommend changing wiper blades twice a year – before they become too damaged to work properly. Replacing blades during one of your spring and fall oil changes, will ensure you should always have wiper blades that can get the job done. AAMCO of Bonita Springs will let you know if your windshield wipers need to be replaced when you come in for your routine oil change. 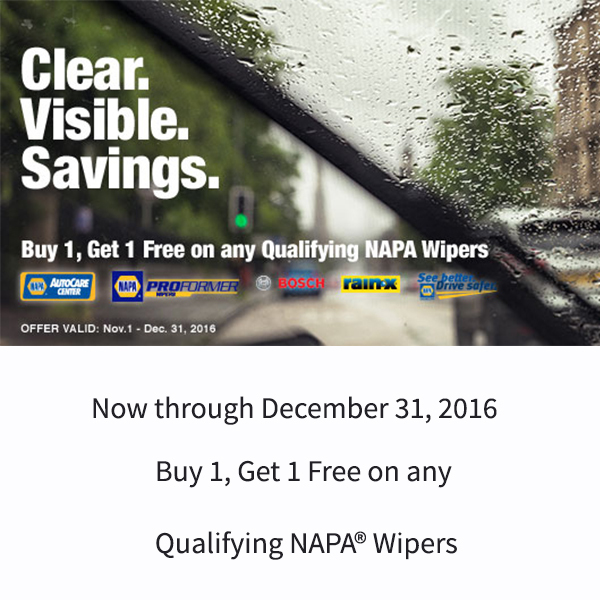 AAMCO of Bonita Springs is a NAPA Auto and Truck Service Center! Car and truck services include: Car care, undercar, heating and cooling, electrical, transmission, electronic, internal engine and heavy duty (engine replacement and maintenance). Previous Previous post: Do You Know What Can Happen if Your Vehicle’s Cabin Air Filter is Dirty – What? You Didn’t Know You Had One? Next Next post: What is a “21st Century Tune-Up”?